John D. Molet went to be in the arms of Jesus on November 27th, 2018. He was born in Chicago, IL., to John Molet and Bessie Arnold Molet. Then, at the age of two, he and his family moved to Henryetta, Oklahoma. He graduated from Henryetta High School and took drafting classes at Okmulgee Tech. He was a member of the 45th infantry Division of the US Army. He was a recruiting Infantry officer for a time. John went to work for the US postal Service in Chicago on Dec. 4th, 1961. John married his High school sweetheart and the love of his life, Donna, on December 30, 1961. They moved back to Oklahoma in 1962. 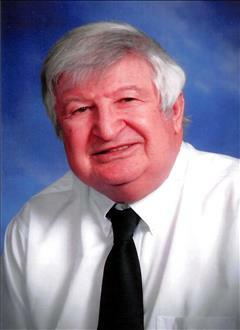 He was a member of Southwood Baptist Church for 14 years, where he served as a Deacon and taught a Sunday school class. In 1989, he and his family joined Brookwood Baptist Church, where he served as Chairman of Deacons for a time and taught Sunday School until the time of his illness. John was involved in everything, including coaching many ball teams. He was a avid OU fan, spending many Saturdays watching football with his boys. John was a man of integrity and truly fit the scripture "well done my good and faithful servant." John was preceded in death by his father John Molet; his mother Bessie Arnold Molet Gavras; and his brother Pat Molet. He is survived by wife of 57 years, Donna Molet; a daughter Shelley and husband Eric Olsen; a son John Scott Molet and wife Heather, and a son, Tony Dominick Molet and wife Jennifer; his grandchildren, Shannon Rae and fiancé Wes, Evan, Talia and fiancé Mason, Ethan, Parker, Vinny, Bella, twins Paisley and Braxton, and Sophia; and a new great - grand baby on the way; and sister, Sylvia Kramer & husband Richard of Henryetta. at 10:00 am, Saturday, December 1st, 2018. Committal services are scheduled for 3:30 pm, Saturday, December 1, 2018, at Westlawn Cemetery. Services are under the direction of Integrity Funeral Service in Henryetta, Oklahoma. The family would especially like to thank and acknowledge Dr. Henry Allen and Excell Hospice for their loving, christian care.